A big night for CBS’s sitcoms. ABC: GREY’S ANATOMY dropped 0.2 to 1.5, and A MILLION LITTLE THINGS lost 0.1 to 1.0. HOW TO GET AWAY WITH MURDER was steady at 0.6. CBS: THE BIG BANG THEORY (2.6) and YOUNG SHELDON (2.0) each rose 0.2. BIG BROTHER: CELEBRITY EDITION was at 1.1, and SWAT slipped 0.1 to 0.8. 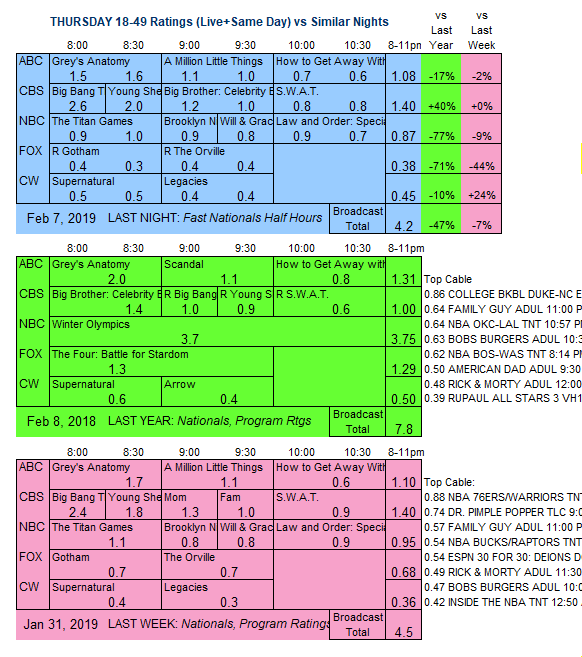 NBC: THE TITAN GAMES dropped 0.1 to 1.0, BROOKLYN NINE-NINE gained 01 to 0.9, and WILL & GRACE held at 0.8. SVU was down 0.1 to 0.8. 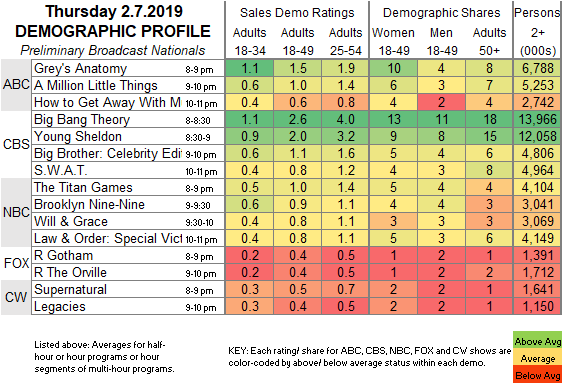 CW: SUPERNATURAL (0.5) and LEGACIES (0.4) were each up 0.1. Tonight, CBS airs a 2-hour BIG BROTHER: CELEBRITY EDITION, and ABC has the annual airing of BE MY VALENTINE, CHARLIE BROWN.